Our second meeting for 2016 was held on Wednesday 20th March. There were 14 pathologists along with 3 veterinary students on pathology rotation. Cheryl began by sharing some aging lesions in mice including a pedunculated lipoma and exocrine pancreatic atrophy and highlighted the variation in size of the remaining islets. Debra presented an odd salivary gland tumour and a nodular mass above the eye. 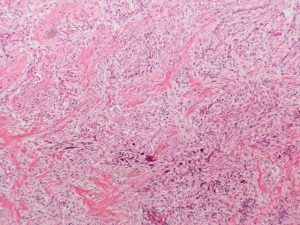 Participants were agreed that the first lesion was neoplastic but felt the second could be reactive but did not come to a conclusion for naming either one. Mike presented an inflammatory nodular pinnal lesion associated with leishmanial organisms. And also a dog with an intra nasal plant foreign body. Mike was intrigued by the ridged structure of the plant material and had discovered these to be lignin spirals reinforcing xylem tracheids involved in water transport in the plant. Trevor presented a number of chicken diseases including Infectious Bursal Disease, Cryptosporidiosis and Adenoviral gastritis and a dog with paraneoplastic interface dermatitis associated with high grade glossal lymphoma. He also presented an odd regular epithelial cell loss of the gastric mucosa that participants felt was likely artefact and could be due to the sample being placed on a gauze swab. Kerstin presented a canine liver with extensive parenchymal destruction, a predominantly lymphocytic infiltrate and myxomatous stroma. Clare presented a case of chronic dermatitis in a dog and a uterine stromal polyp in a Pygmy Hedgehog. 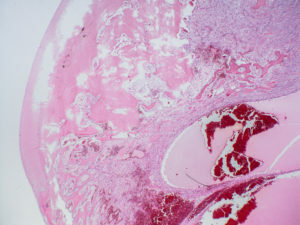 Emma presented a haemangiosarcoma of the thyroid in a 17yr JRT which had metastasised to the eye and discussed similar disease and goitre in humans. 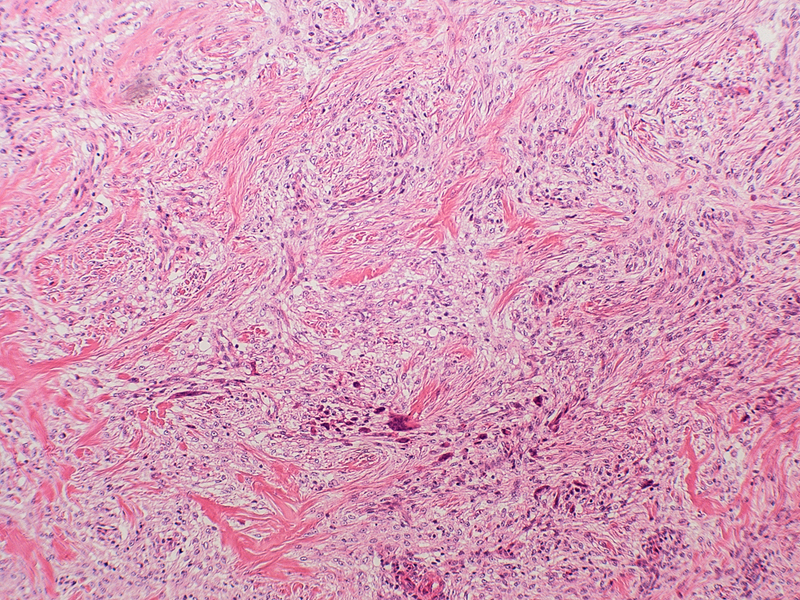 Lucy presented a low grade central osteosarcoma in the femur of a 19 year old cat. Richard presented an unusual fibrous proliferation, likely sarcoma in the femur of a 14 year old cat also associated with cystic cavities. With some discussion of nodular fasciitis this reference is included for interest.